This feature allows prospective members to fill out a form to request more info; their request is sent as an email to a designated email address. 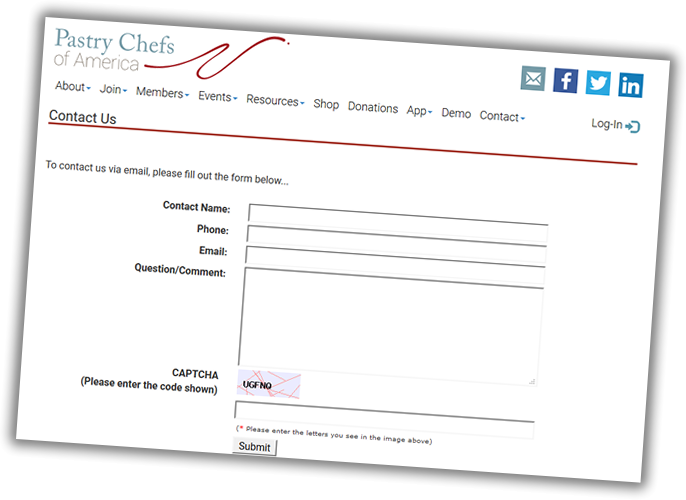 The contact form is highly configurable, and multiple forms may be set up for different purposes. For example, a contact form could be set up for membership inquiries, and another form set up for advertiser inquiries. Integrated with Grid-Page Editor - As a part of the grid page editor, the contact forms can be built as a part of a complex page. This allows for a lot of different handy combinations of text-with-form. For example the left-half may have a list of staffers or board members, and the right-half might contain a contact form. Subject Drop-Down - subject of the contact email may be selected from a drop-down, and based on the subject selected... the email may be directed to a different person. This can be used to allow a single contact form to direct questions to the right person by selecting a given department or officer.